SHA1D is a claim on the publication date of a collision for SHA-1. 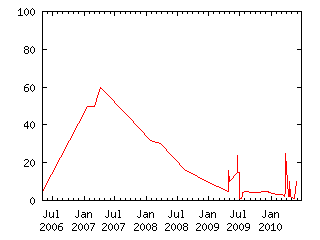 The claim's value decreases linearly from 100 for May 2006, down to 0 for July 2010, at a rate of 2 per month. SHA-1 is a cryptographic hash function defined by FIPS PUB 180-1, transforming an input message into a 160-bit output. It is designed to make it hard to find collisions, that is different messages that produce the same output. SHA-1 undeniably is the most used cryptographic hash function that is still without publicly exhibited collisions. MD5 and SHA-0 collisions have been published by August 2004. A theoretical-only attack on SHA-1 has been published by February 2005. The claim value will be 100 minus the number of half calendar month elapsed between the beginning of May 2006 and publication UTC date, clipped to range [0..100]. The second half of a month starts on the 16th. For example 2007/03/15 pays 80, next day pays 79, 2010/06/30 pays 1, any later date pays 0. The claim will be judged when the judge can determine its value. This will be either shortly after publication of the numerical value of distinct messages which hash to the same value, or at the due date with a value of 0. Will be judged per the unambiguous claim description.